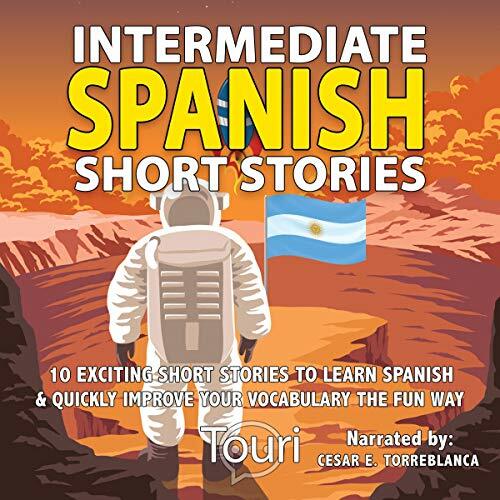 Grow your vocabulary & improve your Spanish skills with these 10 engaging Spanish short stories! There are so many reasons to learn a new language. Just imagine the experience of real Latin culture and fun activities with locals that you will never forget for the rest of your life. The best way to learn a new language is by reading and building a strong base of vocabulary. In this Spanish book you will find yourself glued to every single word of each captivating story that will keep you so engaged you’ll basically forget you’re even learning Spanish! Ten engaging short stories that range from life lessons, ghost stories and even an alien invasion! Filled with unexpected plot twists among other topics that you will find easy to understand and relate to. The stories are broken down into manageable chapters, so you always make progress with the story. Carefully written stories with you as an intermediate in mind, using easy to understand grammar and commonly used words so you can enjoy listening while learning new grammatical structures without being overwhelmed. Tons of natural dialogues in each story that you would actually use in an everyday conversation, which will significantly improve your speaking and comprehension ability at the same time! At the end of each chapter there is a comprehensive guide specially designed for intermediate level readers. You will find a vocabulary list of some of the words from the story as well as a summary in Spanish and English to make sure that you understand the tale completely. Chapter by chapter you will find yourself effortlessly consuming each story. Not struggling like you would in basic Spanish textbooks. You will become captivated by the dialogue of the characters and will learn how to express yourself in different contexts. Most importantly you will see massive growth through new Spanish words that will get you closer to your goal of becoming fully conversational! Enjoy the book and remember to have fun on your Spanish learning journey! So scroll back up and buy Intermediate Spanish Short Stories right now! NOTA: Cuando compre este título, el PDF que lo acompaña estará disponible en su Biblioteca Audible junto con el audio. Languages are one of my interests, and I’ve been holding at intermediate in Spanish for a long time. Reviewing this was an opportunity to refresh my Spanish and even grow it. The format is fairly typical of other language story collections I’d done recently. The language learner could use the audio only, but the best benefit is to use the audio with the accompanying PDF. The stories are presented with new vocabulary bolded in the PDF. After the story is the new vocabulary in story order, not alphabetical order. Then the learner gets summaries of the long story in Spanish first and then English, followed by a quick multiple choice review. While I do like this and have been successful with stories for learning German, French, and Spanish, I would suggest a general change of the organization of the material. It may work better to have the summaries first before going into the long-form story. It will help set expectations and understanding. On review and study, the learner can jump around, of course. The narrator can make or break learning materials, and I didn’t care for his accent in the first story or two. It reminded me of something very close to Castilian, which is a Spanish accent I do not like. I quickly got used to it, and it was no longer a problem. The narrator is very animated and makes the stories sound interesting. As for the stories themselves, I found them imaginative, and some had a space theme that matched the Argentinian astronaut on the book cover. I am a scifi fan, so it was a great way to get some language learning with something I’ll enjoy instead of a typical and often boring language lesson. 10 really great Spanish stories.